Join the Washington Homebrewers Association (WAHA) at Naked City Brewery & Taphouse this evening at 6pm to sample more than ten award-winning homebrews scaled up at local breweries for commercial production. Many of these beers will be going on to compete at the Great American Beer Festival’s Pro-Am Competition in Denver this September. These beers were selected by local breweries during the 2010 Puget Sound Pro-Am Competition. The winning homebrewers then had the chance to help brew their recipe in a professional brewery. Thanks to the hard work of Naked City, for the first time ever, all homebrewers and beer lovers have a chance to sample from the largest assembly of Pro-Am beers available to the public in the history of Washington. Over ten homebrew recipes that were scaled up for commercial production will be on tap at Naked City starting on Tuesday, August 24th. These award winning homebrew recipes were selected from the Puget Sound Pro-Am homebrew competition in April after careful selection from Washington craft brewers. 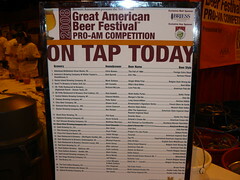 Many of these beers will be sent on the Great American Beer Festival’s Pro-Am Competition in September. More details on the PSPA at www.bewbc.org/pro-am. As a special offer, in the evening AHA members can renew their memberships for a reduced rate ($33 – find Mark Emiley). Come on down, bring your friends, and have a great time enjoying the products of the finest homebrewers and Puget Sound craft brewers! Naked City is a great place, run by great people. Their menu is tasty and thoughtful, too. Gotta say, good beer decent food, but…. I have been there about six times and half of them the bartender was a rude jackass. A little customer service gos along way. Please note owners. You might want to remove the tonight from this story or just the story. Hey let us know if there is ever an event up in SnoCounty.